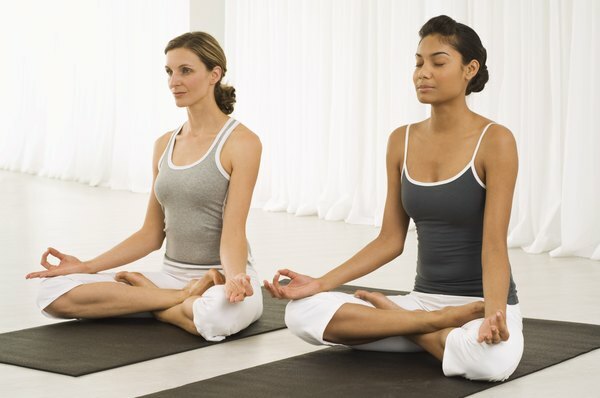 There are 26 poses in each 90-minute session. Bikram Choudhury's practice of merging movement with heat is what happens when you mix an intense 90-minute Hatha yoga session with a steam room. Some call it "hot yoga," but one thing is certain -- Bikram yoga is more than just a bit humid. With thermostats set at a balmy 104 degrees Fahrenheit, Bikram studios will leave you stretched and toned, and with a metabolism ready to burn calories as you face your day. The Bikram routine is balanced to provide a whole body and mind experience. While Bikram yoga doesn't focus on reducing trouble zones, such as love handles or bulky thighs, the poses, which began as a way to heal ailments, are tied to body parts. Poses that tone the abdominal region are the Half Moon, Standing Bow and the Toe Stand Poses. Toned muscles increase your resting metabolism -- your body's ability to burn fat at rest -- and help stabilize your spine. A natural metabolism booster, super forms of yoga -- like Bikram -- rev up your body's ability to burn fat. An ideal method to trim fat, even from the lower belly, actress Rebecca Romijn turned to Bikram's humid routine to shed the 60 pounds of post-baby weight she retained from having her twin daughters. By turning up the heat, authors of "100 Ways To Supercharge Your Metabolism" Cynthia Phillips, Shana Priwer and Pierre Manfroy suggest the body sheds more calories. 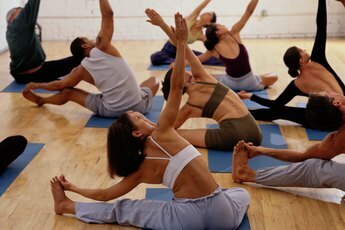 One session, they state, can burn 300 to 600 calories, with Bikram's skilled practitioners able to burn 500 to 1,000 calories per 90-minute class. Celebrities who practice yoga always grace the covers of magazines, sporting toned muscles, their bare arms looking svelte in sleeveless tops, their ripped legs adorned in tight leggings or glowing in nice tans and short skirts. Like Rebecca Romijn, their hidden yoga gem may just be Bikram, especially for those belly-baring bikini-clad tabloid shots. Bikram's hot, humid, temperatures help ligaments and muscles to stretch, thereby reducing stress placed on them, increasing circulation, improving flexibility and purifying the body of toxins as the body sweats, according to Krishan Kumar Suman, author of "Yoga For Health and Relaxation." Suman says these factors help Bikram yoga tone the whole body. Like doing situps, the Half Moon Pose works your core, even tightening the muscle groups along the sides and down into the lower abdomen. The Half Moon pose is one of three poses in the 26-pose Bikram routine with a focus on the abdomen. Stand with your feet together, toes pointing forward. Bring your arms together over your head and your hands together, touching at the palms. Tighten your abdomen and bend your torso to the left, creating a "C" shape with your body. Stay in this position for 30 seconds before returning to neutral. Bend your body in the opposite direction, holding for 30 seconds. Increase the distance your bend each time.